Childcare in Northern Ireland is astonishingly expensive. Full-time provision costs about £800 per month, which is more than most mortgages, and that is only for one child. For two, or three, simply multiply that amount. It isn't like this everywhere. Sweden, often held up as the gold standard of childcare, has a means-tested system which caps payments at little over £100 per month, per child, for your first two children. Thereafter costs per child actually reduce dramatically. Unlike in the UK, where the idea of having multiple children in childcare can be terrifying and make would-be parents reluctant to have more kids, Swedish mothers and fathers can relax a bit about this vital aspect of family life. Parental leave following the birth of a new child is also significantly more generous in Sweden than it is in the UK. However, childcare is not all about pounds and pence. High-quality early years development greatly improves the prospects for each individual child. Unfortunately, this only makes the local picture look worse. Again, Sweden is at the forefront, with a holistic model which sees no philosophical distinction between pre-school and childcare. Their system - Educare - integrates education and care provision into one single model for all children between the ages of one and six. In NI, local parents fork out huge amounts for childcare, discouraging mothers from returning to work, hoovering up money that could otherwise go elsewhere in the economy, all to pay for less-than-premium provision. And it doesn't end there. The UK, it transpires, loses on all fronts. Consider also that frontline childcare staff are not well paid - the opposite, in fact - and even that private providers of care are not exactly drowning in profit either. We pay all this money for what seems like no benefit. One of the most prominent working parents in Northern Ireland right now has the luxury of bringing her baby to work, at least some of the time. 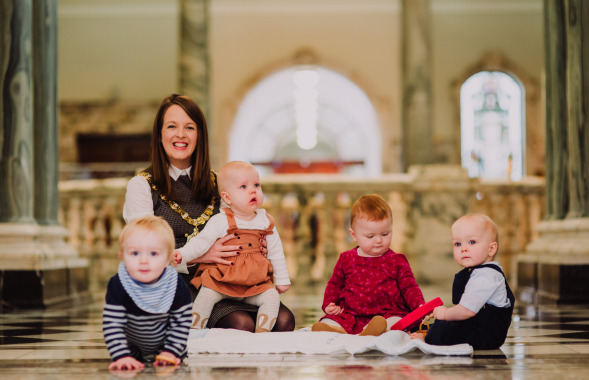 Lord Mayor of Belfast, Nuala McAllister, has taken baby Finn to various official events during her tenure. In the past couple of months, she has even hosted a parents and tots morning and even a baby rave at City Hall. "We enjoy spending time with Finn at different parenting groups, so why not bring that to City Hall? It was just nice to have City Hall open for a different age group, with a different kind of noise, and it was very positive." Scope spoke with Cllr McAllister about her own thoughts on the stifling pressures childcare places on parents, and what improvements she would like to see. "Childcare needs to be more affordable. Whether that is through more efficient vouchers, or funding schemes from the government - whatever is the best way forward. "As things stand, we don't have enough people accessing the vouchers that we do have, or enough people who can afford to get back into work. "Grandparents are picking up a lot of this work, but that is not possible for everyone. For instance, people are working until they are much older. "So, what do you do? Put a child into childcare where rates can be quite extortionate. There is also a lack of flexibility. You can only pay, in most cases, for half or full days." The Lord Mayor said that people who work odd hours can, therefore, find themselves having to pay a disproportionate amount of already significant fees, adding that while universal free childcare might be an ideal solution in principle, it was unrealistic and more pragmatic aims are necessary. Ultimately, like most parents, she has no strict ideology about how childcare should be delivered - it just needs to be cheaper, and better. Thankfully, this appears to be possible. Early Years - the organisation for young people, is a Northern Irish NGO that is also a world leader in child development. CEO Siobhan Fitzpatrick has addressed the United Nations on early years issues. She told Scope there is plenty we can do to revolutionise local childcare. The starting point is integration because, while child development and getting parents into work and all the other aspects that childcare can address seem like standalone matters, there really is no conflict and so an overarching approach can bring savings through efficiency. "Some people talk about childcare for working parents, some people talk about it for child development, but if you have a holistic approach - that most modern countries do have – you will meet the needs of children, families, communities and employers. Unfortunately, we don't have that vision here in Northern Ireland, or in the UK really." The crucial difference between the UK and Swedish models is, she says, the nature of government intervention. While the UK relies on tax and benefits to help parents, with the market then providing options, Sweden has a heavy focus on supply-side subsidies. "Without subsidy, the private sector doesn't pass on low costs to parents because it's a highly labour-intensive industry, highly regulated, and that's why parents are paying astronomical fees for not really the best in terms of quality childcare. "Looked at the amount of money that Scandinavia and the UK are putting into childcare and there is not a huge difference. The UK is putting a lot of money in but not getting the same type of results, i.e. the high-quality, really-well-subsidised system." Of course, childcare in Sweden is not free. There is a heavier burden on the public purse and this comes with other concerns - but the benefits can be huge. Provision is affordable, it is top class, staff in the settings are well paid - and, moreover, parents are able to get back to work and, while money does come from the public purse to support the childcare settings, this means the cash that parents would otherwise spend here goes elsewhere in the economy. "The money spent on childcare doesn't even go into paying a decent wage for those who are looking after the children. Because we don't have a childcare strategy, the money that parents are paying is being used totally inefficiently. "We don't have the highest-quality provision, we have mainly private sector model where there's a range of fees. In most countries where there is good subsidisation there's regulation of fees. Workforce issues have not had due attention - again, because we do not have a strategy. "There's no real attention to supply and demand. In some areas you will see over provision, but in some others - particularly in some rural areas - there is no provision whatsoever. The whole thing has suffered from a serious lack of attention and a total lack of vision." These problems are fixable. However, just when it looked like Stormont would provide a solution, local politics collapsed. The Early Years CEO continued: "It has been very frustrating. While other regions of the UK have made substantial strides towards improving the situation, we have been at the starting stage since 2004. "The Department of Education took over responsibility for leading on this in 2016, which we were delighted about. What we really want is a strategy from birth to 25. "I met with them and they told me that a final draft of a childcare strategy was ready to go. That was before the Executive collapsed. Then, at another meeting in February, when it looked like there might be some moves [to get the Assembly up and running], they said it would be the number one priority for a new minister." "We can use [Stormont's collapse] as an excuse at the minute but not for the whole period since 2004. This was in the Programmes for Government in 2011 and 2015 - there were commitments to publish and implement a new childcare strategy. Instead a document was produced, Towards a Childcare Strategy. "A couple of early actions focused on out-of-school activities, and a little bit of focus on rural and children with disabilities, but actually funding for all of that has now run out. The whole thing is an absolute mess."